Safe Speed Forums • View topic - Why do drivers speed? Post subject: Why do drivers speed? This topic relates to Safe Speed Page: "Why do drivers speed?" I was reading the Why? page and followed the link to the DfT Vehicle Speeds report for 03. Looking at the bar chart for speeding numbers by road and vehicle type you have to wonder if artics are speeding because they've got limiters fitted. On motorways about 2-3% of HGVs are speeding (presumably with either no limiter or it's been disabled), but on dual and single carriageway NSL roads it looks about 87% and 74% repsectively. That's a far larger proportion than for other vehicle types on the same roads (bikes about 50% and 22%, cars about 50% and 9%, light goods about 44% and 9%, bus/coach about 39% and 23%). On built up roads with 30 and 40 limits the proportion of speeding HGVs is smaller than either bikes, cars or light goods. What is it about trucks on NSL roads? Are the limits too low for modern HGVs? Or are drivers getting so frustrated with enforced delays on motorways due to the limiters that they are more likely to speed on NSL roads to make up some time? If so it looks like limiters are adding to the problem in yet another way. I know the report says the numbers have slowly fallen over the last few years, but it only goes back to 1998. I thought limiters went back earlier. Any idea what the proportions were before trucks had limiters, say late 80s to early 90s? What is it about trucks on NSL roads? Are the limits too low for modern HGVs? Don't forget that for an HGV (or LGV as we're supposed to call then now) on NSL roads, the limits are 40mph single, 50mph dual. Very easy to "drift" over, and almost certainly too low for modern vehicles with stop-you-dead air brakes. The "making up time" element is probably there too. ... a high proportion of HGVs, in particular the largest goods vehicles, were exceeding their speed limit of 40 mph. For example, 74 per cent of articulated HGVs were exceeding their 40 mph limit and 23 per cent travelling at more than 50 mph. Wonder how many of those 23% were sitting on the limiter too. Incidentally, just to confuse things the report still uses HGV, even though they're supposed to be LGVs now. To confuse things even more they use LGV as well, but it means Light Goods Vehicle . Are we all keeping track? There'll be questions later. Fantastic article! Absolutely 100% agree with all of your points. I think you represent my thoughts exactly. I can't believe, for example, that people still believe roads are the dangerous places they are portrayed to be when most of us use the roads every day for long periods of time and never experience any kind of accident whatsoever. It's amazing how blinkered and brainwashed we can be without realising that the evidence to nullify these outrageous claims is right under our noses. This page: 'Why do drivers speed?' may well be the single most important page on the whole web site. I want to know why it isn't getting more attention. Perhaps people don't find it. Perhaps people don't understand it. Perhaps people don't agree with it. But to me it's pretty close to the answer to everything. I'm about to rewrite it as an article for publication. Comments needed. It's interesting as a possible reason for why rigid enforcement of speed limits has increased injury crashes in New Zealand. It's also consistent with Hans Moderman's work which indicates removing bureaucratic controls (explicit and implied by engineering) improves safety outcomes by transfering responsibility to the road users. If drivers set their speed to "speed limit+x" as some seem to claim, we would expect the proportion exceeding the speed limit not to vary with road type. The conclusion drawn is that drivers are selecting a safe and appropriate speed. Actually, drivers are selecting what they think is a safe an appropriate speed. Trying to get to 60mph on a rural single carriageway is difficult. Not only are these roads frequently unfamiliar to users, but they are filled with dangerous oncoming vehicles, pedestrians, livestock etc. The roads are frequently bending and winding, its often impossible to see more than 20 metres ahead on these roads. The average speed on these roads is listed as 50mph. Perhaps the conclusion we can draw is that the speed limit here might possibly be a lot higher than the average safe and appropriate speed. In a built up area people tend to cruise at about the same kind of speed: 35mph, whether its a 30 or a 40 zone. Is this a safe speed, or is this the easiest speed to travel at in a normal car in fourth gear? The simple fact that crashes are rare is absolute proof that drivers are very good at setting safe and appropriate speeds. Remains false logic. I am not saying its not true, but the logic doesn't flow. The simple fact that crashes are rare is absolute proof of the rarity of crashes, and that is the only conclusion that can be drawn. In order to draw the conclusion you have with any certainty is by having having a large group of people obeying the speed limits and selecting what they believe to be the safe and appropriate speed within those limits. And by having a large group of people who select what they think is the appropriate/safe speed whilst being able to ignore speed limits. If the latter group have less accidents then you can draw your conclusion. the poll answered “Yes”. They were then asked what gear they would normally use when trying to maintain a steady 30mph. 54% thought that they should be in either fourth or fifth gear. I do my best to stick to the limits in built-up areas as there is negligeable impact on journey times. I do not have much of an issue with these - third gear suits the speed well, though my compliance is down to not wanting to get prosecuted rather than feeling it is always ONLY safe to drive at these speeds! I used to generally drive about 50000 miles a year as a nationwide field service engineer (one year I topped 80000! Good year, that!). In all these times plying up and down the motorway network, I never even came close to having an accident on motorways whilst travelling at between 80mph and 90mph (or even above that to be brutally honest!) where the conditions allowed. In fact it was easier for me to keep away from potential trouble spots like bunches of other vehicles with a reasonable amount of speed over the limit. An adequate and comfortable speed differential can be maintained over vehicles being overtaken. Stick to 70 and overtaking vehicles (even governed HGVs) takes longer to accomplish. This means that you spend longer at risk from the overtakee (if such a word exists) pulling into the side of you through not checking their mirrors properly, etc. I had the misfortune to sustain a couple of speeding tickets in '98 and noticed that this type of thing started to happen to me in the immediate aftermath when I was trying to stick to 70. Quite simply this was not an issue before! The scariest episode was on a dual carriageway stretch of the A9 heading north to Inverness when I lorry I was overtaking suffered a blowout to one of the tyres on the trailer. The vehicle lurched a bit and shreds of tyres flew off and hit my vehicle. Had I been doing 80 or 90 the time of exposure to this hazard would have been reduced considerably by reducing my exposure to the risk. True, the results of a crash would have been more severe, but at 70 the results of a crash are bad enough anyway and the duration of the risk is longer as it takes longer to overtake. 70 feels very slow on a good road with good visibility. On a long journey boredom starts to creep in and then fatigue. At 80 or 90 there is ample time and space to react to scenarios, the drive is far more engaging, progress feels good and concentration at a maximum. Any faster and things start to become hairy unless blessed with a virtually clear road (or the M6 Toll!). Strangely enough shunts and pile-ups seem to occur when the motorway is busy and the traffic is lucky to peak at 70 for a few seconds. Weather can complicate matters further. I have not seen an accident happen when the motorway has been clear enough to allow 80 or 90 to be accomplished safely. I feel motorways are the most strident example of poorly (and unscientifically) thought out speed limits. The majority of Trafpols I have spoken to don't tend to bother about speeds of up to about 90 unless driven erratically. The thing is that this clouds the judgement of many people where the limit is necessary. This coupled with the overzealous enforcement by the 'safety' camera partnerships netting in millions of pounds is having disastrous effects the roads in general. These are simply my observations, but I have yet to find a scenario to cause me to rethinkg my views on the issue of speed. 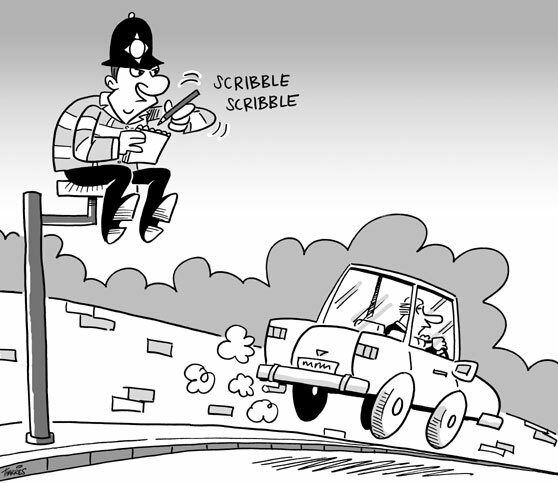 Surely it is normal and safe behaviour to adjust your speed to the road conditions. Isn't that what we are trained to do? Sometimes a number on a stick is too slow, sometimes it is too fast. I see roads where the speed limit has been reduced from 60 to 30, 60 to 40, 40 to 30, and so on - for political rather than safety reasons. Of course, there will always be some drivers who have no sense of danger and will drive at an inappropriate speed - they are the ones that need to be dealt with. "The best speed camera is one that has been removed and replaced with a traffic police officer"
I like it! I hope he was using some discretion. I think I meant the traffic officers in patrol cars who can tackle the dangerous offences that cameras cannot detect. I have read this and tried to analyse my driving. I consider myself a good and safe driver with 35 years experience and somewhere about 1 million miles covered in UK and European continent on business. I am a regular competitor at National level in gravel rallying. I have had several speeding convictions from 1996 onwards when speed enforcement seemed to have become a priority in the UK almost all at 95-97 on clear motorways or dual carriageways. I have always driven firstly and foremostly to my perception of hazards. Rain etc in other than clear wide roads reduces my speed. In many built up 30 limit areas I find myself doing 22 -25. But the same area at 02:00 might be safe at 40. I only occasionally used to check the speedometer and can tell my speed to +/-5 or 7 mile/h ( or +/-1 mile/h in the Landrover). This is plenty good enough but not unfortunately in the new SCP era. Generally speed limits were appropriate and I found myself doing about 5-8 mile/h faster before enforcement. Choice of car influenced this - I found myself driving at about 85% of the car's maximum speed. Not now - everywhere I go I see absurd reductions in speed limits and their extension far beyond what is justifibale as a built up area. 70 is inappropriately slow for many UK dual carriageways. I deliberately avoid long motorway journeys where traffic ambles along and I feel that the other drivers also exhibit lack of concentration and drifting from lanes ( due to abject boredom ?) is an increasing risk. Driving on A roads used to be generally a pleasure - it is now a form of suffering. With the dumbed down skills of fellow motorists, overtaking an LGV sticking to an absurd 40 limit is not so much of a problem as the dozen cars sheepishly following in its wake. Does one pass at speed risking being nicked by another hidden talivan or does one overtake at up to 60 risking a head-on with another train coming the other way. The current rigid speed defined enforcement campaign is nothing about safety. Despite all the advances in vehicle technology ( and I'm not talking air-bags ) driving is far more unpleasant, driver skills are lower and concentration on hazards ( including my own ) is definitely lower than ever. Fortunately my business driving is now largely conducted outside the UK. The govt and its SCP quangoes are doing much to damage the UK economy by this policy. Thanks for a great website. The truth will out eventually. I learned to drive at 20, and I'm 40 now. I've had two my-fault crashes when I was about 24 and 30, both very low speed rear-end shunts caused by distraction (loud music, and in-your-face billboard respectively). Since 2000, I've picked up several points for speeding, all just over 50 mph on 40 mph dual-carriageways. Last year, I took the IAM's excellent advanced driver training. I also regularly ride a pedal-bike, so I am well aware of the cyclist's point-of-view; my only serious cycle crash has been with a kerb that suddenly jumped out of the road at me in an empty supermarket car park. 30 zones: In some times and places, 15 mph is too fast and I do 10 or less, in others, the limit is applied to a wide empty road with no pedestrians/shops/houses, even dual-carriageways, and 45 is safe. At any speed, the driver has to be extremely alert as to conditions such as the possibility, age and attitude of pedestrians. The recent 20 mph limits are ridiculous. Slow speed and watching out for pedestrians is already indicated by 30 zones. In many places, the 20 mph zones are in streets made single-lane by parked cars, where a competant driver would already have the sense to be driving very slowly, or by schools which are already marked as hazardous - but not 24-hours a day! Once you start marking parts of urban areas as 20 mph, why not some as 5 or 10? Then you can completely automate the cars to comply, and let the drivers go to sleep in their super-safe carbeds. 40/50 zones: Single carriageway: Usually around the appropriate speed, but sometimes placed on fast roads with relatively few hazards. Dual carriageway: often inappropriate, and frustrating to keep to. NSL/single carriageway: I'm not surprised that few drivers exceed this speed limit; some seem to regard around 40 as a comfortable speed at all times except motorways. It is pretty fast for many of these roads, except on long clear straights. Some NSL road sections are only safely passable at 20 mph! The point is, on roads like this, the driver can get on with working out the appropriate speed himself! The only time I'd really exceed this speed limit by is overtaking, where I regard anyone worried about the speed limit (pre-SCams) as having a death-wish. NSL/Dual carriageway: OK for short stretches. Long stretches feel little different from motorways, and often have similar cruising speeds for much of the traffic - of around 80 mph. Motorways: Ever since I learned to drive, I've found 85 mph to be a comfortable cruising speed. My hairiest moments have invariably been at much lower speeds, trying to join the motorway and judge rear traffic speed and distance by headlight at night. 20 years later, I still find 85 mph a comfortable cruising speed, although on a clear motorway in perfect conditions and a fast car, 110 is fine. I've done it occasionally, but I wouldn't regularly, because the motorway isn't usually that clear, other cars don't expect it, and I would lose my license. But on many a short journey, I don't go much over 70. Wouldn't it be possible to re-calibrate speed cameras to shop pedestrians-on-wheels, for the rather underused offense of "failure to make due and adequate progress on the Queen's Highway"? # We promise to present the facts without misleading presentation. # Any error of fact will be repaired or removed as soon as possible. # Opinion should always be immediately recognisable as such. "We undoubtedly have a minority of reckless individuals...But I expect everyone will agree that we're talking about considerably less than 10% of the population." "If you are a normal responsible motorist who regularly exceeds a speed limit, your chance of causing a speeding related fatal accident is probably 1 such accident in 200,000 years. " These appear to just be statements of opinion without any supporting factual evidence. Perhaps they should be removed in order to comply with your rigorous standards of objectivity and fact-based argument? If you have recognised them as statements of opinion, then what is the problem? I suspect using figures from elsewhere on the site, Paul could probably come up with some reasonable stats to underpin the latter statement about the chances of an accident. In future please don't post such queries twice. 3. Subconciously we only consider the safety of ourselves and our passengers. We do not consider the safety of motorists or pedestrians, cyclists, bikers, horse riders and animals. If any of those were really true we'd be crashing every week. Yet the average driver only causes an injury collision with excessive speed as a contributory factor once in 1,200 years. If we then adjust for over the speed limit ( http://www.safespeed.org.uk/aands.html ) the number rises to once in 4,000 years. If any of those were really true we'd be crashing every week. Well not necessarily. The reasons why people speed -as in drive faster than the posted limit - are not absolutely bound to the outcome of their 'speeding'. I'd certainly agree with Henry that most drivers don't consider what could happen in the event of a crash, and that they feel safe and isolated inside their nice comfy cars. This does not mean that they are accidents waiting to happen - most drivers have some recognition of a developing hazard situation and appear to mitigate the outcome of a crash by adjusting their speed beforehand. By how much, to what effect and whether going slower would make the outcome of any crash less severe remains open to argument.